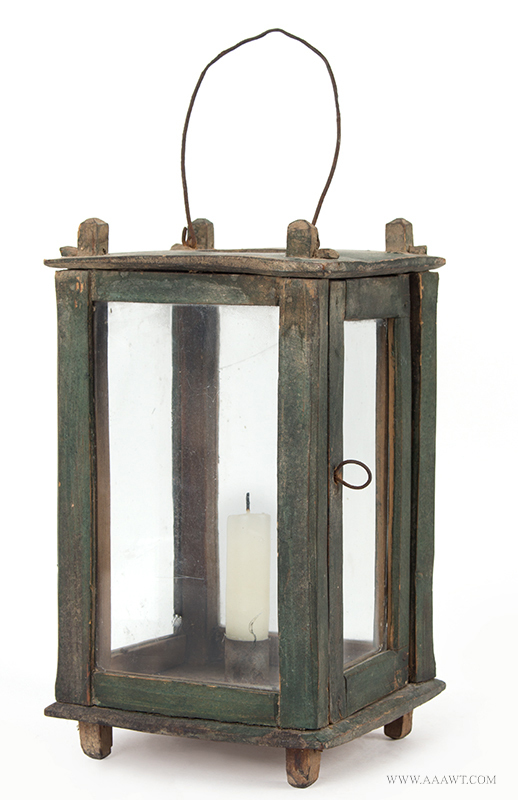 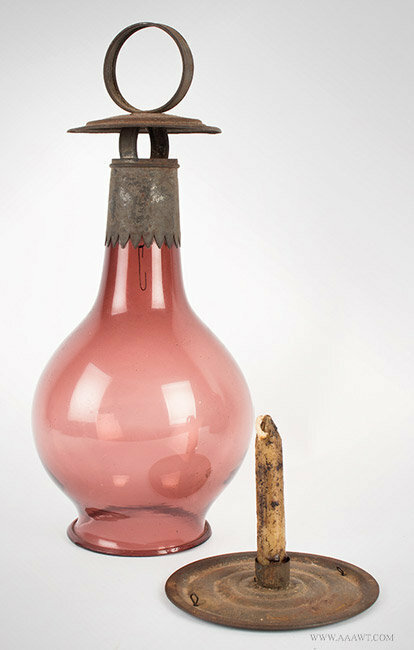 A pair of light-weight chains or wire would have held the base with candle socket snug to chimney base. 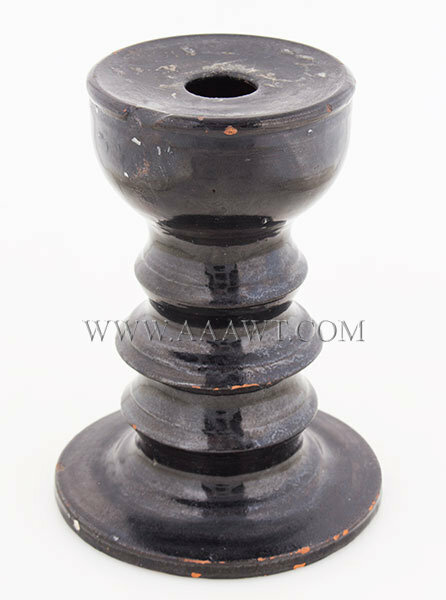 We are not certain that the accompanying base is original nor do we have the chain; however, the form and color are worthy of restoration. 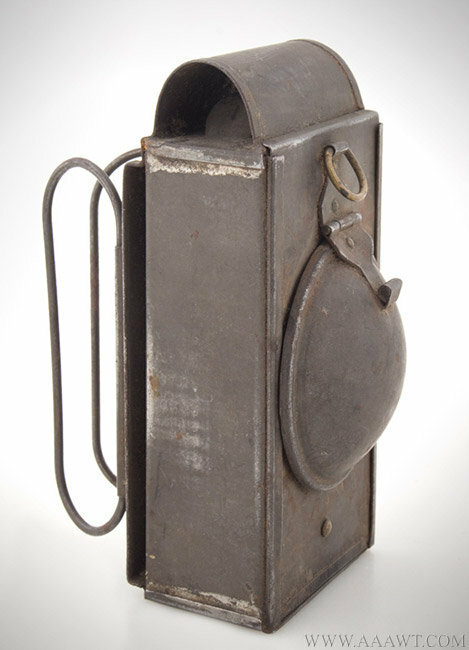 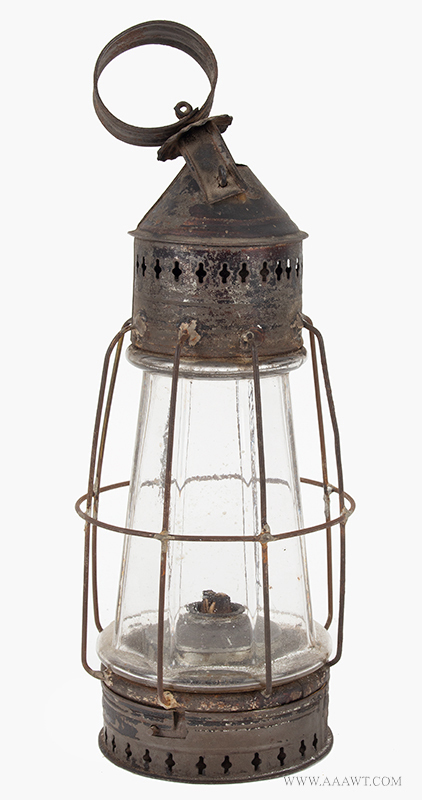 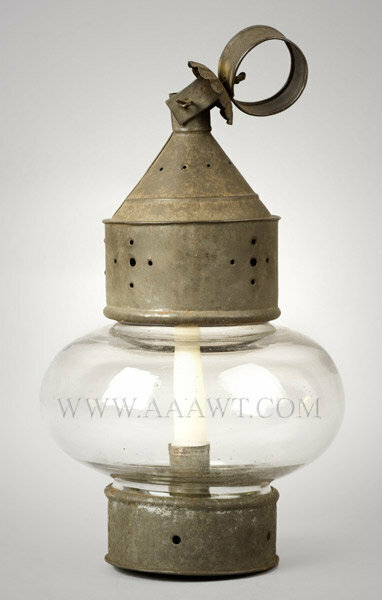 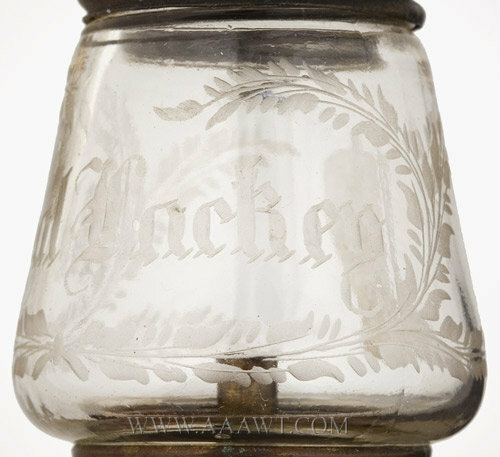 From the master tinsmiths perspective, the BEST little barrel back hand held lamp; pierced for ventilation, tubular handle; displaying exquisite design, masterful craftsmanship and remarkable condition. 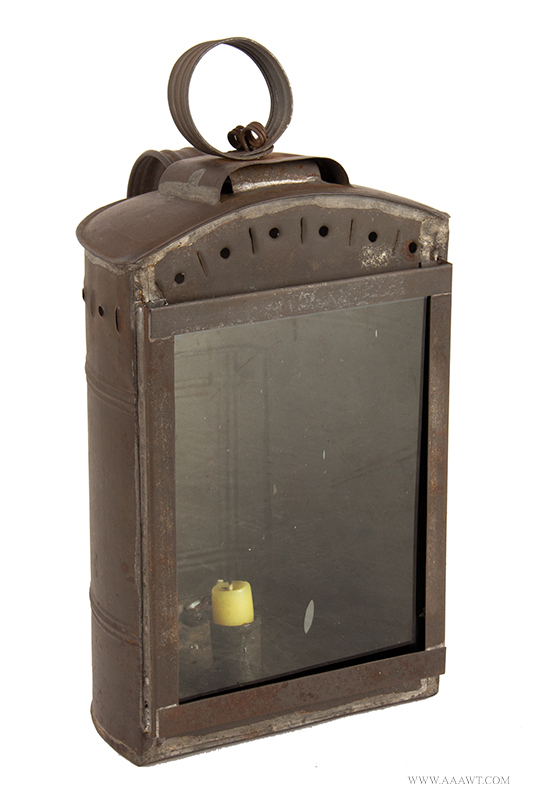 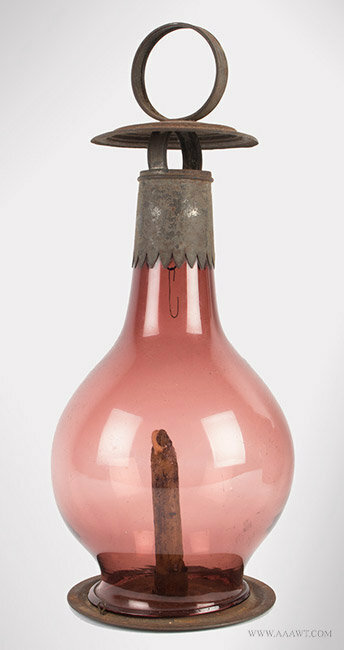 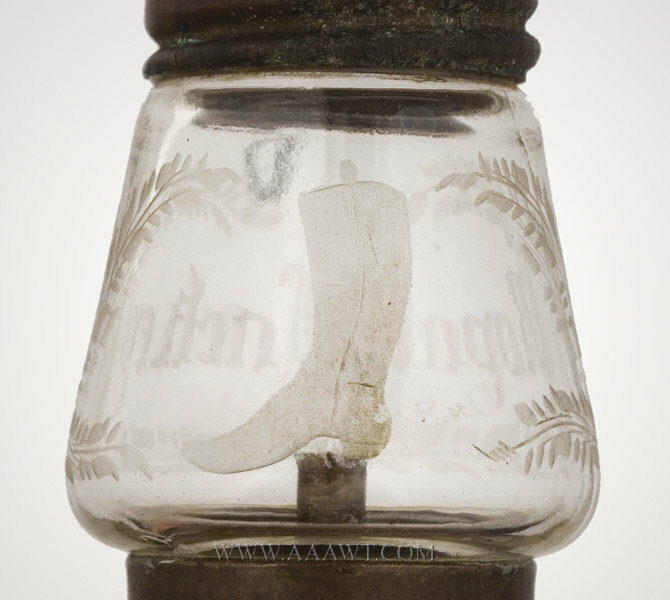 Brass lamp in old oxidized surface, the shade is engraved and frosted; "Royal Lackey" centered by leafy wreath; the other side features a high mans boot. 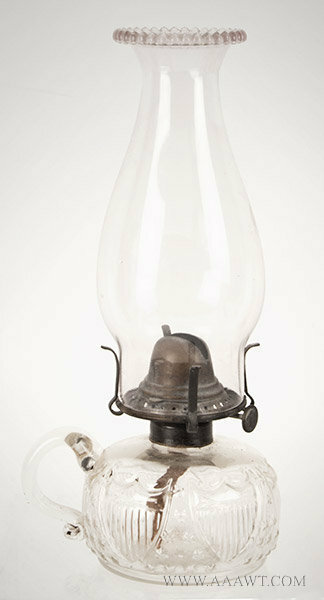 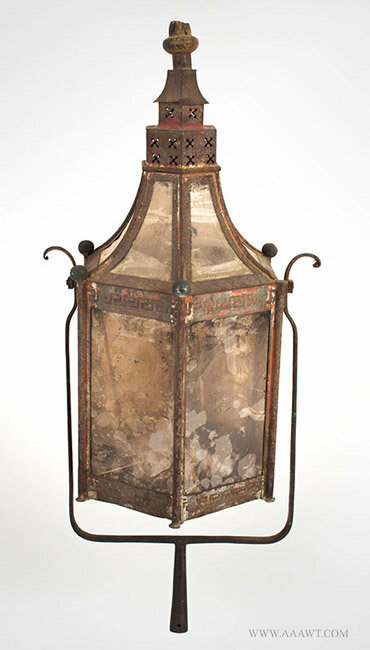 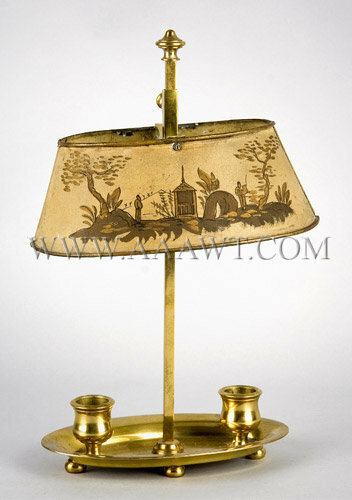 The lamp style is pictured with a period advertisement in Lamps III by Catherine Thuro; pp. 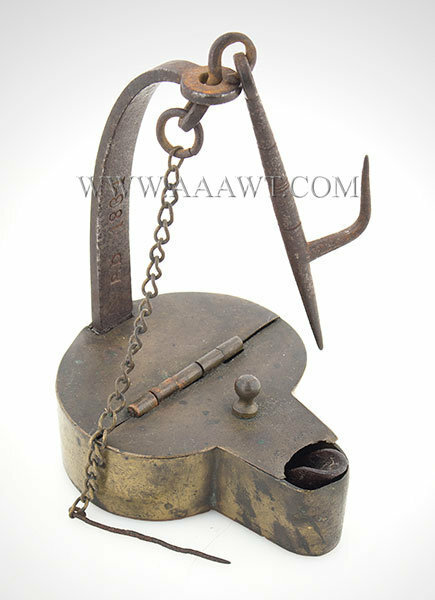 214 and 215, figures a and b. 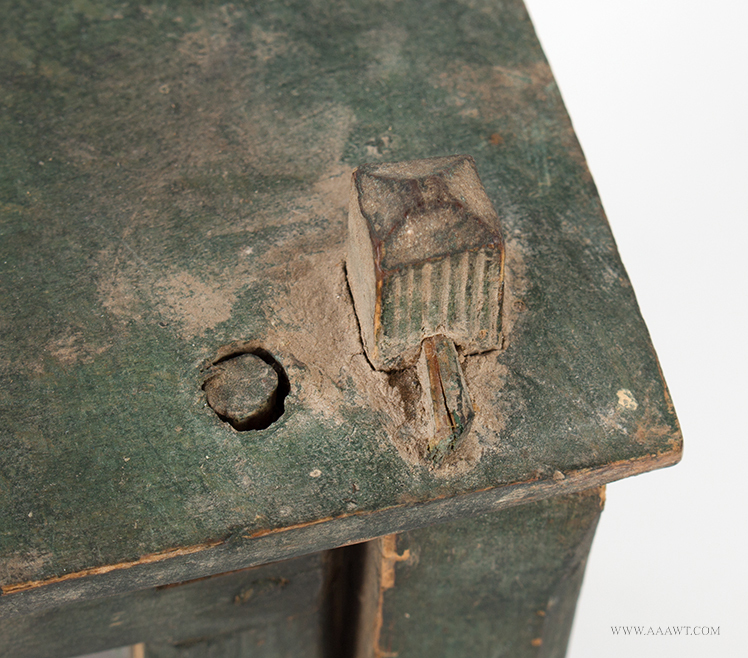 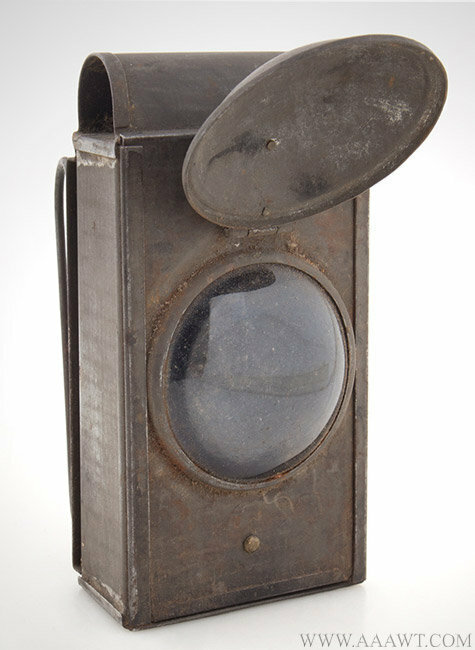 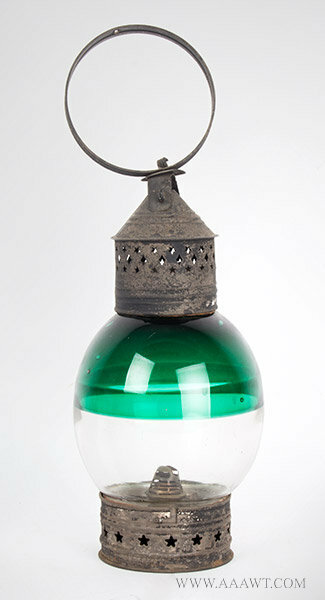 This 7.5" lamp is in good condition; some verdigris on base, minor imperfections' limited to base as is often the case. 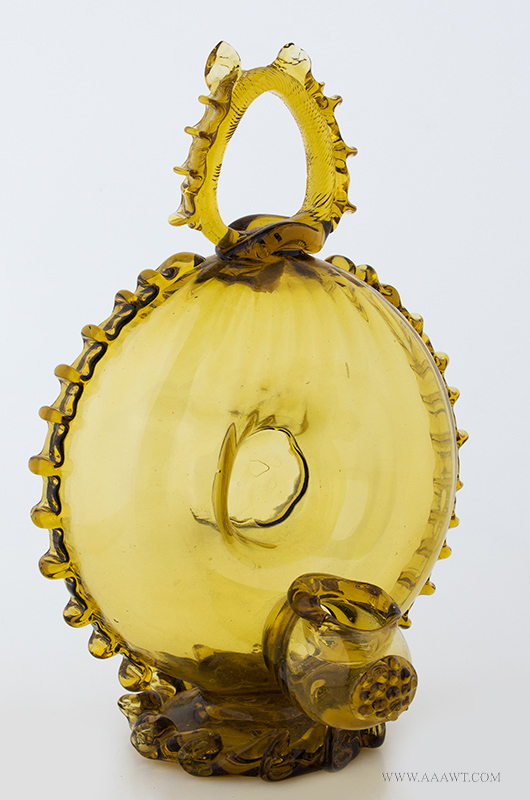 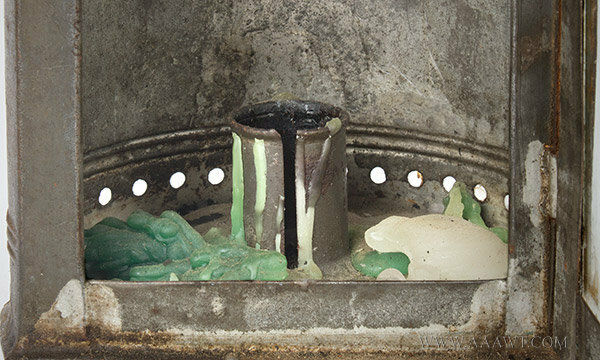 Single candle socket, light green and light amethyst bullseyes with rough pontil scars set with soft rippled clear glass. 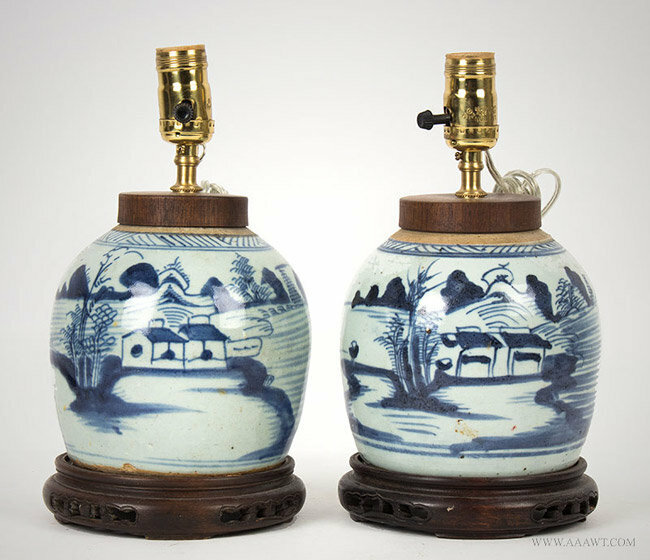 See Garvan, The Pennsylvania German Collection, page 228, figure 17. 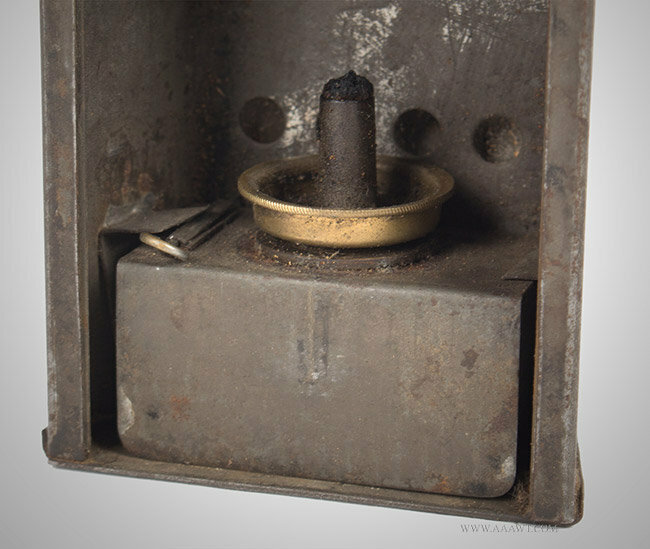 The open top grease kettle within trunnion mount features dual central wick supports. 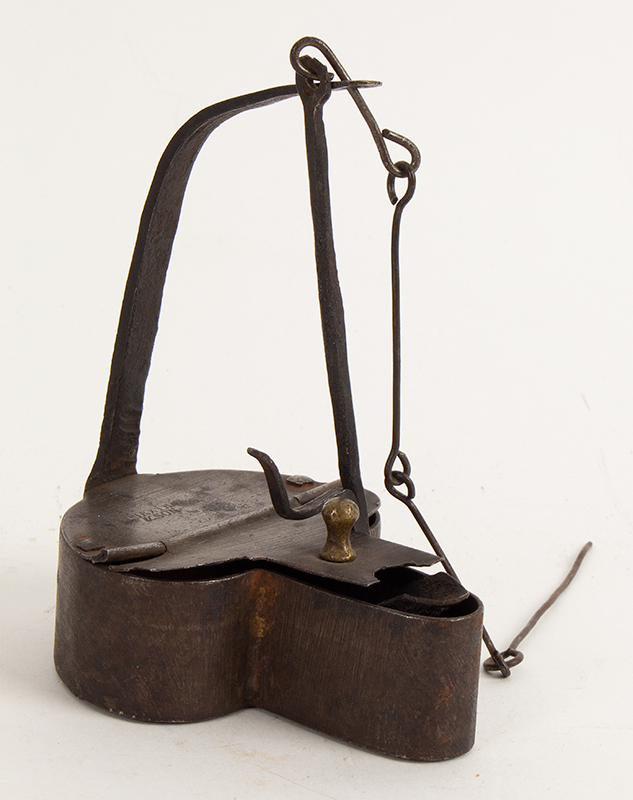 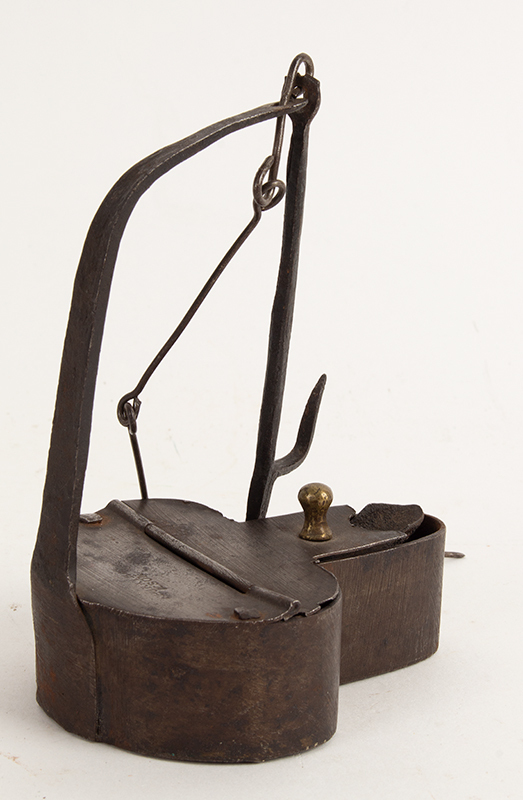 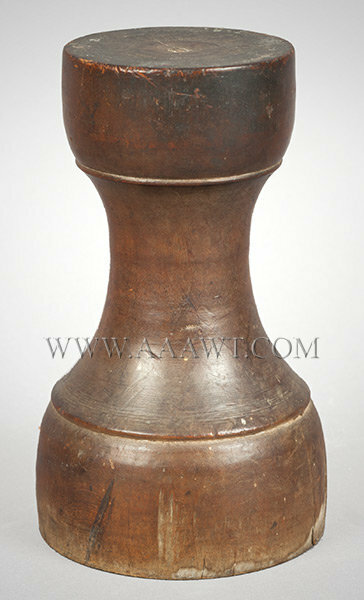 The kettle is raised on white-smith finished shaft having baluster knop; the whole on domed circular foot. 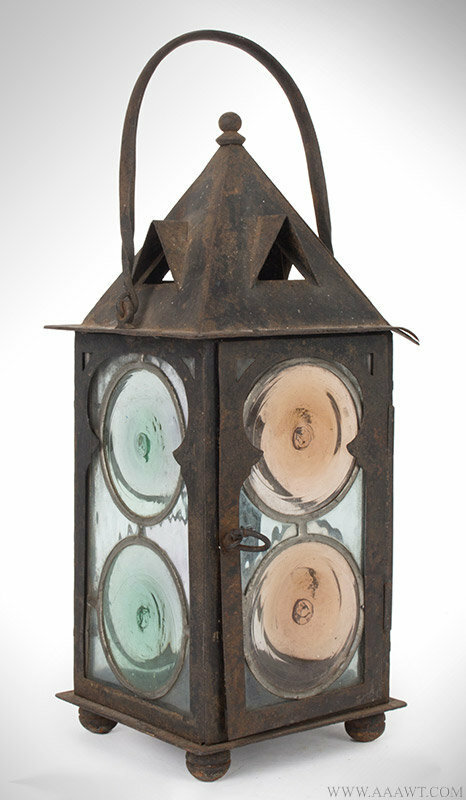 Very good condition, color, and patina; H: 11.5". 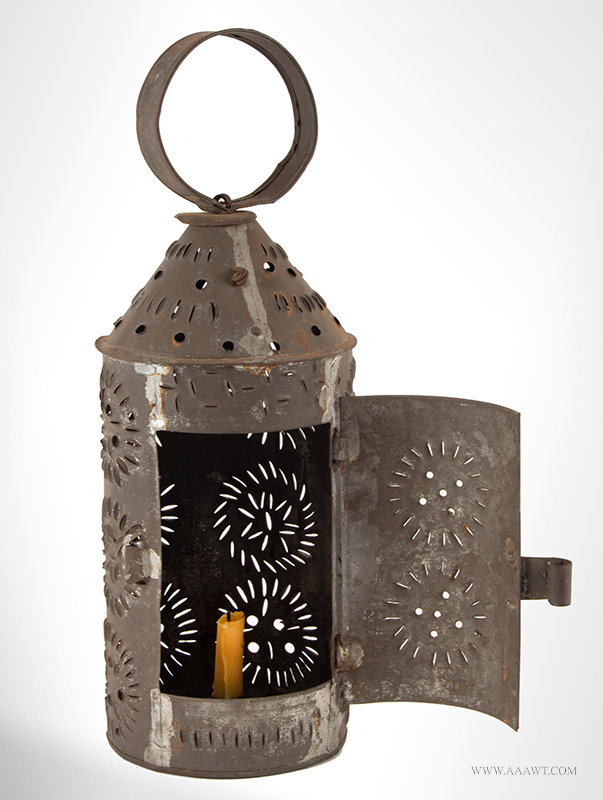 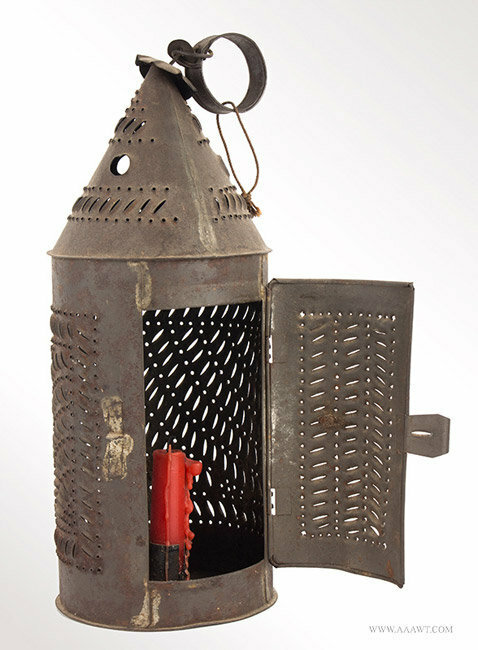 This dramatic lighting device is constructed of tinned, rolled sheet iron, wire and glass. 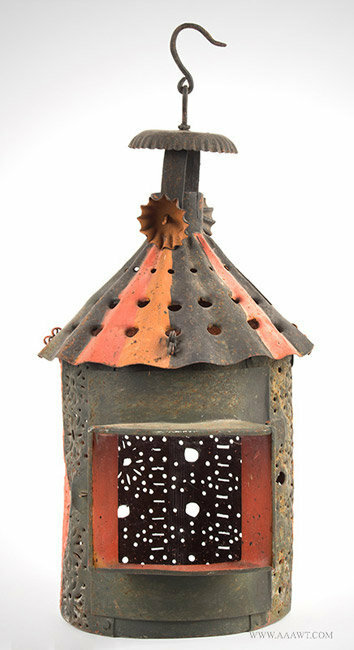 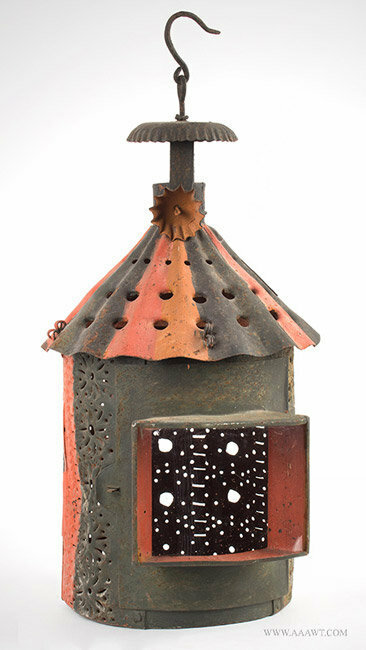 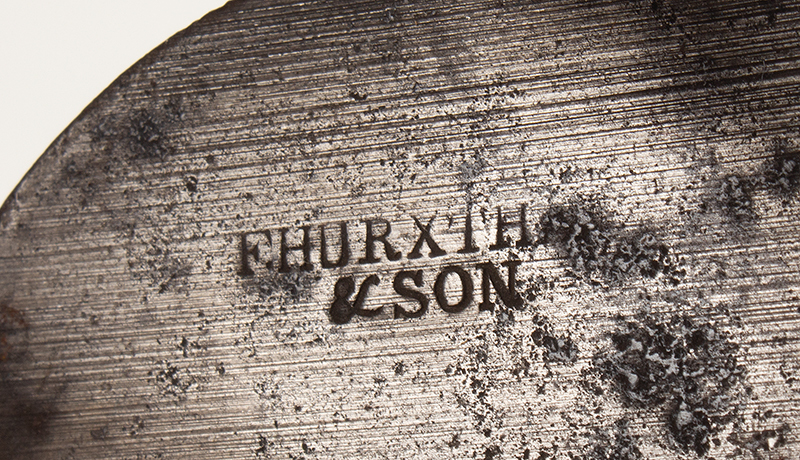 Dimensions: 18.75-inches high, 11.75-inches wide, 9.5-inches deep. 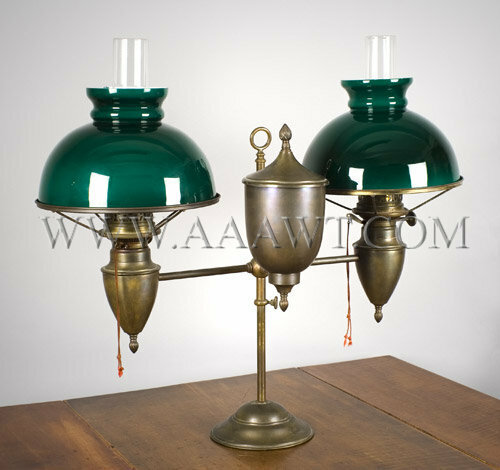 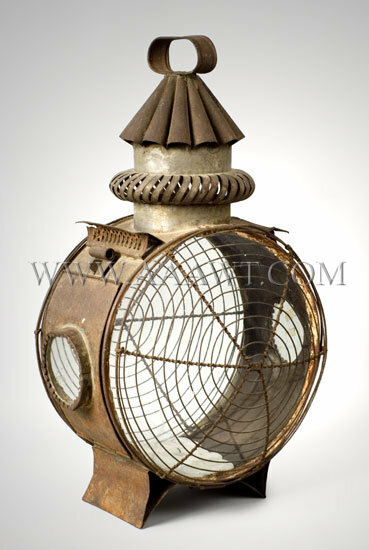 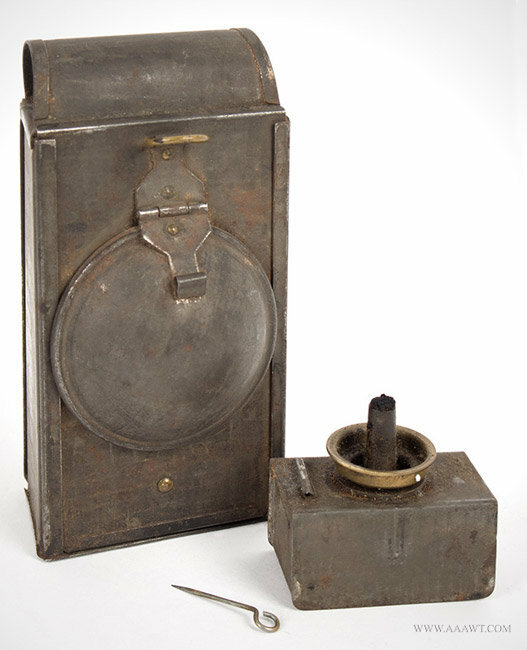 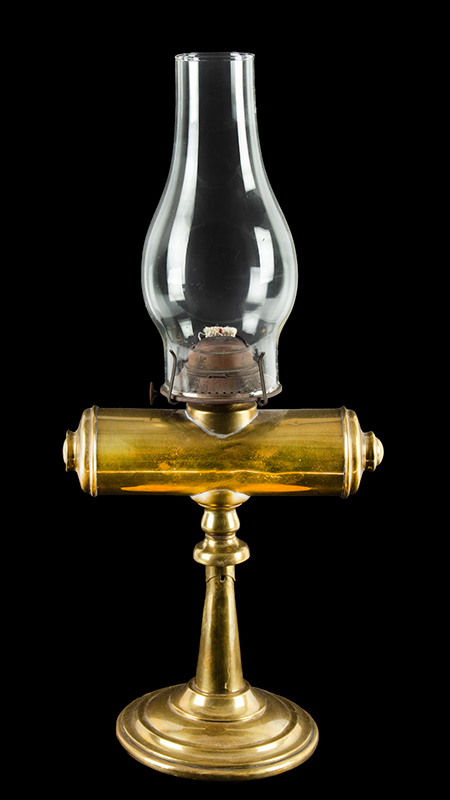 As depicted, a brass double student lamp, burners marked "B/H DUPLEX" on thumbwheels, extinguishers have original pulls, cased shades with green exterior and white interior (one has chips on top of rim), not electrified. 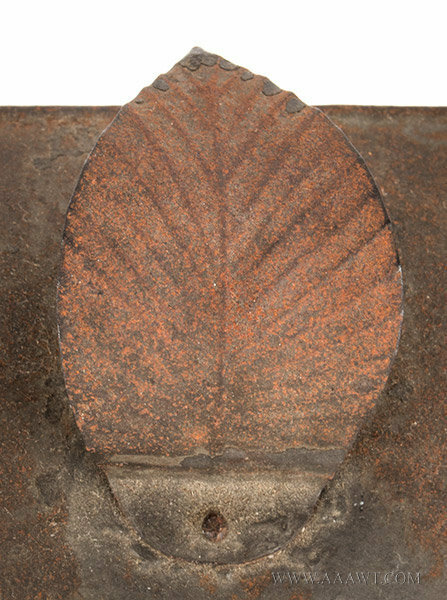 (Height: 14.75-inches without shades; 21-inches high with shade; 23 5/8-inches tall with chimney; width: 27-inches.) 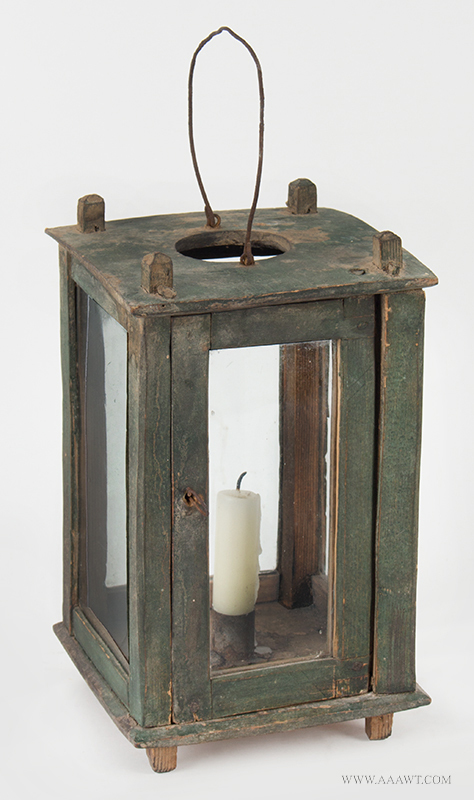 Old patina; never before on market...from original family. 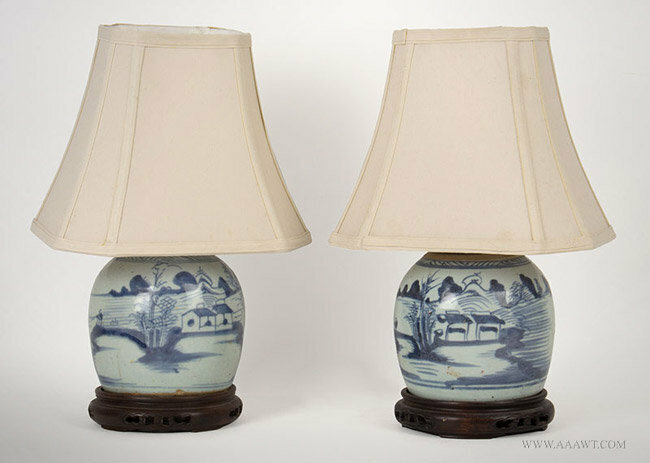 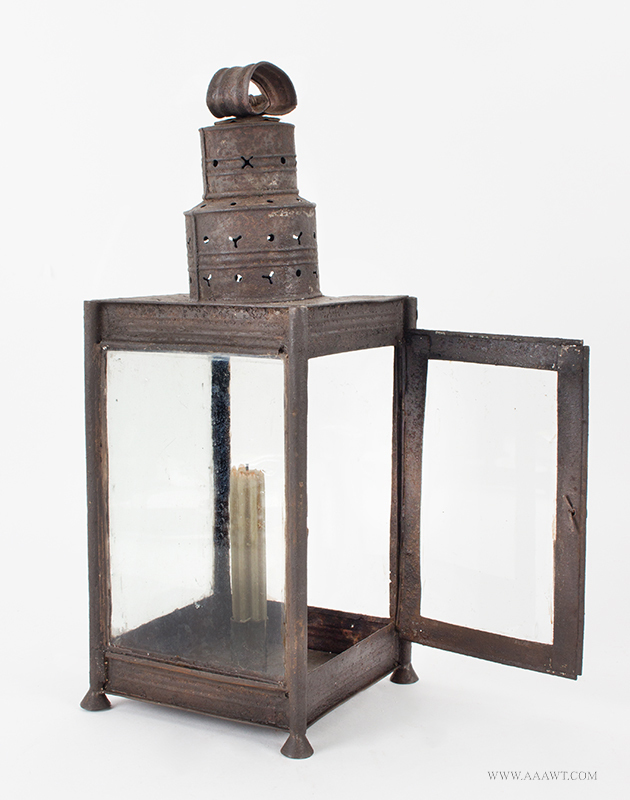 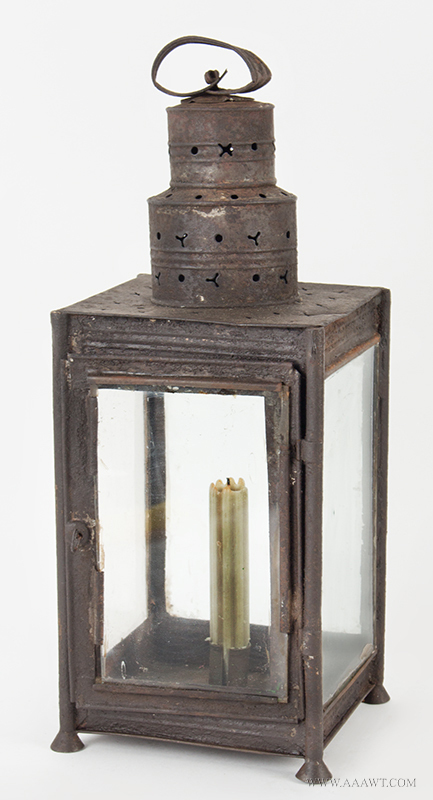 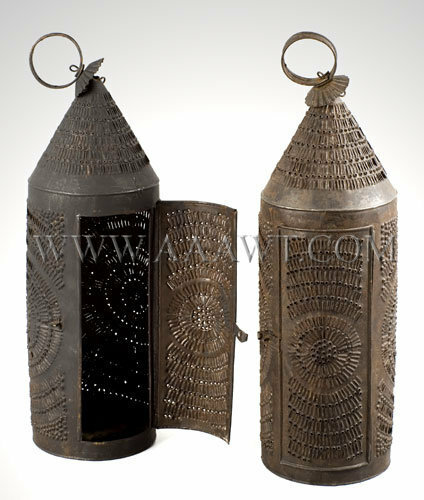 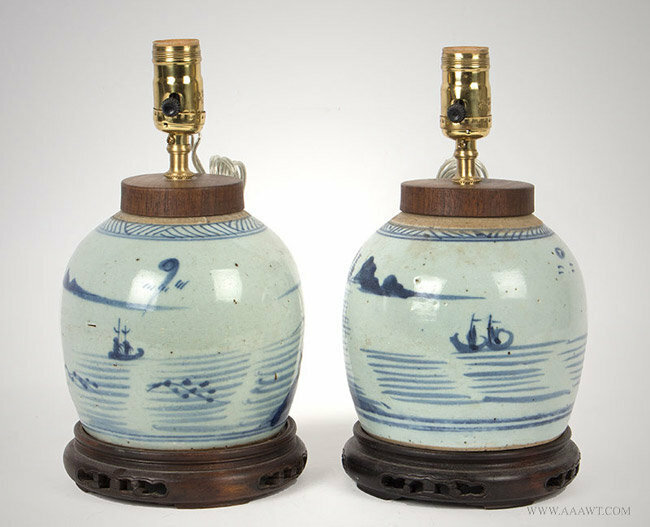 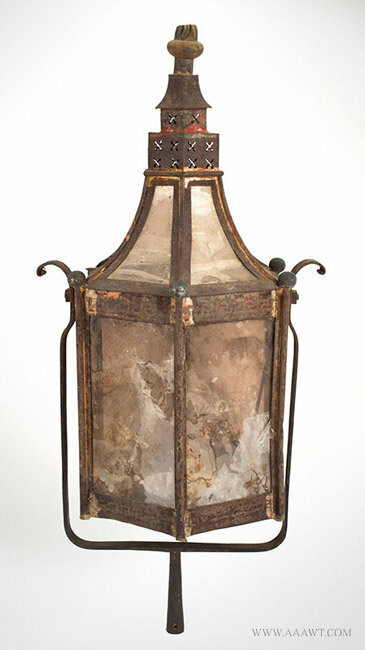 As depicted, a rare pair of lanterns beautifully ornamented and in excellent condition; one lantern in old black paint...the other never painted. 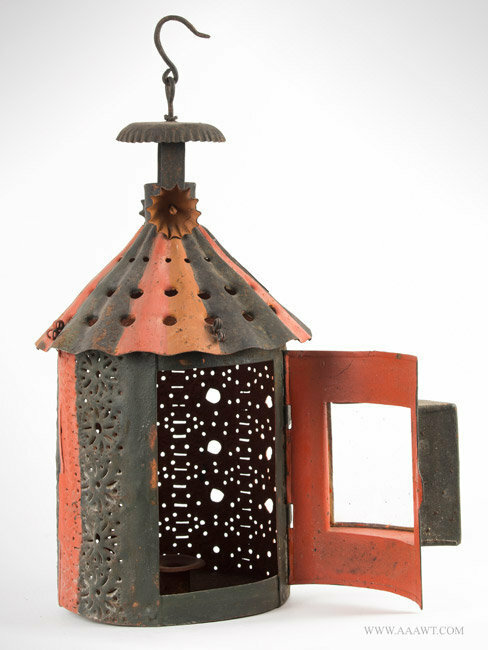 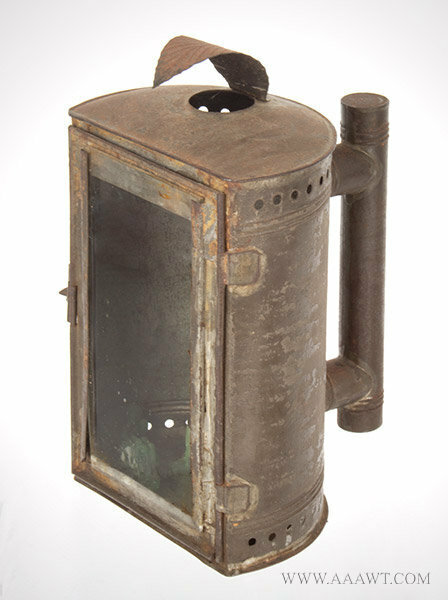 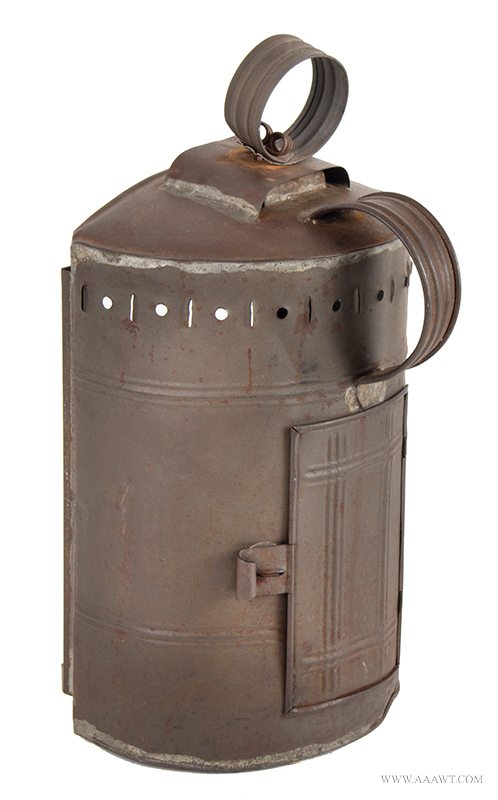 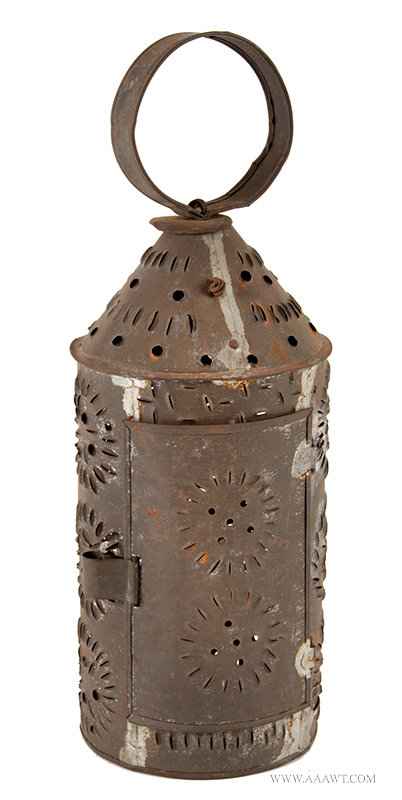 All sheet-iron construction...the pierced chimney with conical top above the case with bull's-eye glass lenses set within out-swept reflectors. 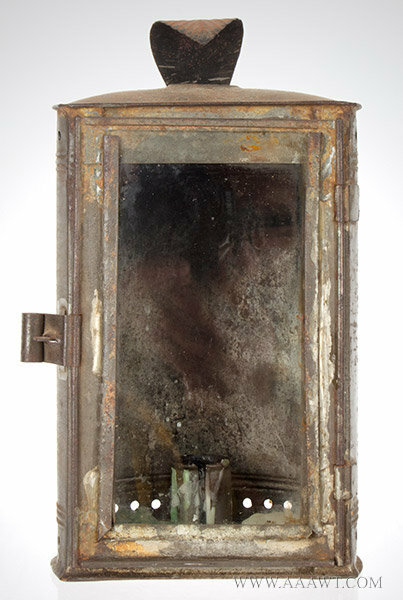 The door that is hung on a wire and folded iron hinge opens to expose brackets that would receive colored lenses. 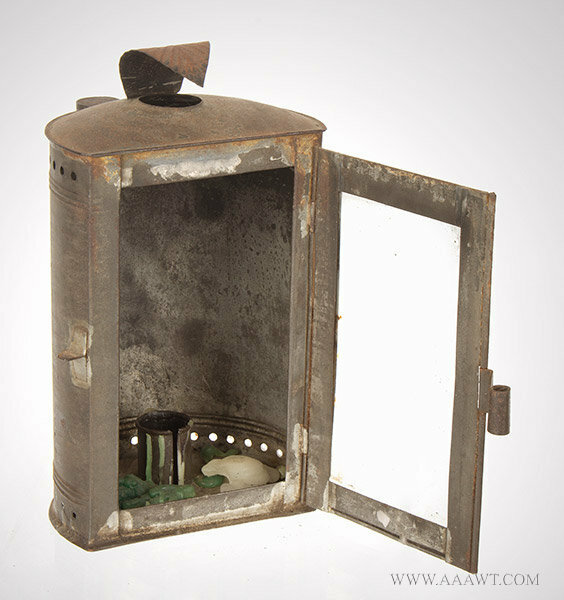 The burner is missing, all else fine. 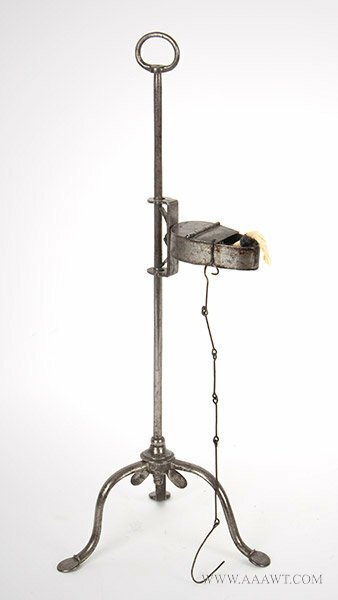 Height: 19-inches; 7 by 7-inches. 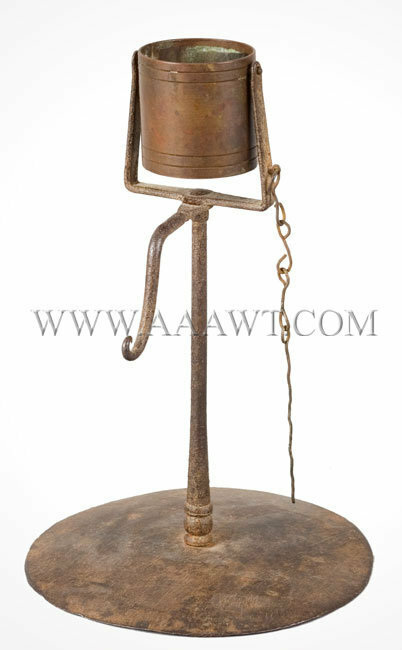 Carrying ring, crimped smoke/heat dome, gimbaled, great color, H: 14"
Cylindrical with conical top having candle holder, crimped shield and loop carrying handle; all-over punching and slit ornamentation; single tabbed candle socket. 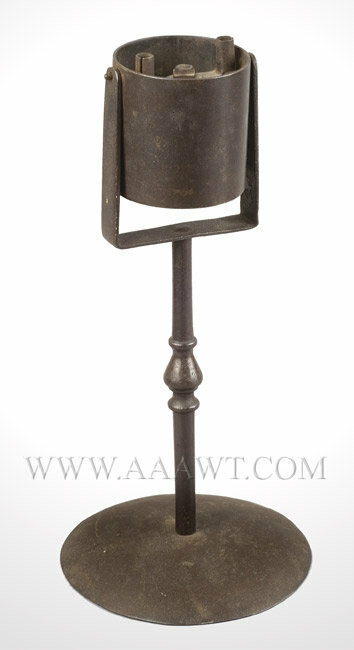 Dimensions: 21.5" H, 7.25" base diameter.